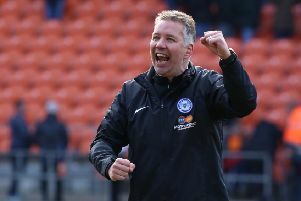 Tom Nichols celebrates his debut goal for Posh at Chesterfield. Photo: Joe Dent/theposh.com. Peterborough United’s players are now playing for their futures at the ABAX Stadium. That was the clear message from manager Graham Westley after a terrible performance in defeat at Fleetwood on Tuesday (April 5). Adil Nabi during his Posh debut at Gillingham. Photo: Joe Dent/theposh.com. Westley insists the only way to apologise for that 2-0 loss is to beat Rochdale at home on Saturday when the manager is again set to ring the selection changes. Westley has made roughly 2.5 changes per game during his time as Posh manager. He’s named an unchanged side on just four occasions and not since the 0-0 home draw with Southend on January 16. During his first 18 matches in charge, Westley made 27 changes to his starting line-up. He’s made 68 changes over the following 19 matches. But the boss is now set to give priority to those players who he expects to be key to next season’s promotion push. Leo Da Silva Lopes is a highly-rated 17 year-old Posh midfielder. Photo: David Lowndes. “We’ve given lots of players lots of chances to produce the goods. “We now have to make decisions as to who is going help us get to get promoted to the Championship next season. So who can Posh fans expect to see against Rochdale or in the remaining games at Colchester, Barnsley and Shrewsbury and at home to Scunthorpe and Blackpool? 1) Tom Nichols: The 22 year-old striker scored on his full debut at Chesterfield, but has failed to make an impact since. At £250k he will be keen to avoid being labelled ‘the next Luke James’ so should be given a run of starts to get him up to speed. 2) Adil Nabi: According to Posh chairman Darragh MacAnthony, this attacking midfielder from West Brom was his manager’s main January transfer target. He struck the crossbar with his first kick as a Posh player when coming on as a substitute at Gillingham, but has made just three appearances (one start) in two months. 3) Leo Da Silva Lopes: The pressure is off so it’s time to unleash the 17 year-old midfielder. Give him the last six matches. 4) Callum Chettle: Surely it’s only right to play a contracted Posh player over one at the club on loan? Especially if Posh aim to give main midfielder Chris Forrester a well-deserved, extended break between now and the end of the season.